Located just outside Las Vegas & available for acquisition or joint venture. 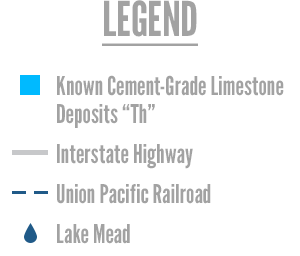 Las Vegas is the only major metropolitan area in the United States without a local Portland cement manufacturing facility. 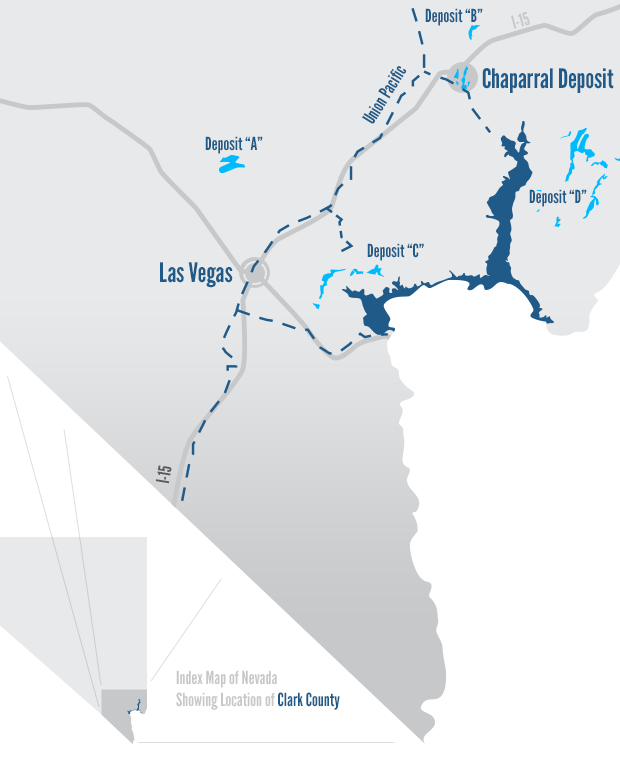 Chaparral Limestone and Cement Company (CLCC) has obtained mineral and other rights necessary to build and operate a cement manufacturing facility 55 miles from Las Vegas. These mineral rights range between 180 million and 200 million tons of cement grade limestone. CLCC has preliminary commitments for water, natural gas, electricity, air quality rights, gypsum and iron ore. CLCC is interested in partnering with, or being acquired by, companies who will build a state of the art cement plant to supply Las Vegas and surrounding areas with cement. Why Chaparral Limestone & Cement Company? Nevada does not have corporate income tax, personal income tax, unitary tax, franchise tax on income, or inventory tax. The State of Nevada also offers incentives to new companies employing more than 50 people including sales & use tax abatement, sales and use tax deferral, personal property tax abatement, renewable energy abatement, and new employee training grants. CLCC’s mining claims are within ¼ mile of the Logandale/Overton off ramp on Interstate 15 in Southern Nevada. The claims are 56 Miles from Las Vegas and 67 miles from St. George, Utah. Members of CLCC have had a number of meetings with county, state and federal officials regarding the construction of a state of the art cement manufacturing facility on its claims. The response has been overwhelmingly favorable. Response to CLCC’s proposed project is favorable because of the positive economic impact this type of project would have in the Southern Nevada area for the rest of this century. Interested in a business opportunity? CLCC owns the mineral rights on over 1,000 acres of a visible limestone outcropping immediately southeast of the Logandale/Overton off ramp on I-15. Limestone volume estimates range from 182 million tons to over 200 million tons based on the depth of the deposit. Surface samples & 3 test drill holes show limestone / calcium carbonate (CaCO3) as high as 97.5% in a significant amount of the deposit. Samples also show magnesium (MgO) at less than 2%, with mercury (Hg) almost undetectable in a parts per billion analysis. There are several commercially available sources of silica sand and gypsum nearby. CLCC’s mining claims are located in the Lower Moapa Valley “220” air shed. There are very few, if any, polluting industries in air shed 220. 220 is in an “attainment” area. The increment levels in area 220 have not been exceeded. This means that a cement manufacturer should be able to develop a new facility, obtain operating permits and air quality permits much easier and more economically than in any other area in Southern Nevada. Kern River Gas Transmission Co., has constructed a major natural gas line which runs parallel to Interstate 15 approximately 1 mile from Chaparral’s deposit. This line presents tremendous economic benefits to CLCC. Not only does the availability of gas provide additional energy sources, and the potential of environmentally friendly fuels, it may provide many tax advantages. Mining, milling and culinary water is available in the Lower Moapa Valley where CLCC’s mining claims are located. The Moapa Valley Water District recently received federal funding to improve its entire water system. The improved water system crosses CLCC’s southern claims. District officials have been pleased to learn of a potential new customer for their water. The District is agreeable to provide water to this project at competitive published rates. The Overton, Nevada Power District No. 5 has two power lines which cross CLCC’s claims. There is a 12,500 volt line and a 69,000 volt line. The District has agreed to provide, at reasonable commercial rates, all electrical power necessary for the successful operation of a cement producing facility. Chaparral is also investigating the viability of solar power in meeting all or a part of the electrical needs of a cement manufacturing facility. Local businesses, water district personnel, County Commissioner Tom Collins, and the public seem to be genuinely excited at the prospect of a new cement production facility near Logandale/Overton. Many local residents have voiced strong support for the tremendous employment opportunity a new cement manufacturing facility would provide. CLCC’s claims are located less than ¼ Mile from the I-15 Logandale/Overton off ramp on Interstate 15. Union Pacific Railroad has a spur within a few hundred feet of CLCC’s claims. The convenient highway and rail access creates a number of competitive advantages for CLCC. Interested in the acquisition, or a joint venture of, the Chaparral property? Reach us via the form or contact information below.